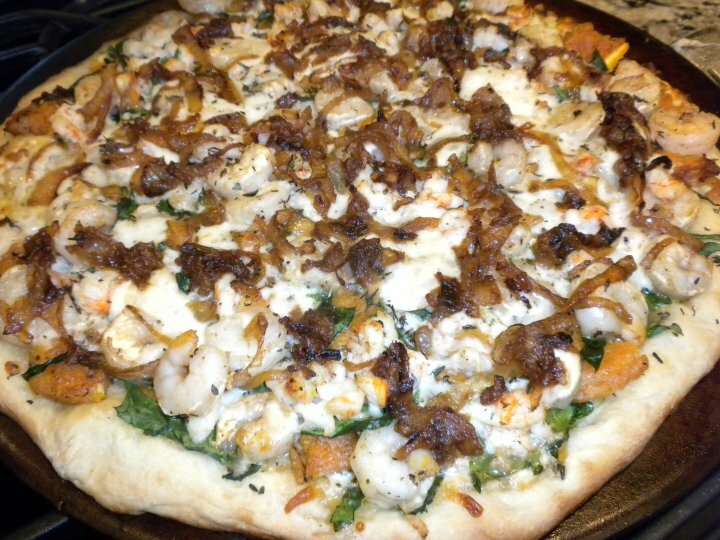 Spectacular Shrimp & lobster Pizza! Lemon, shrimp and lobster pizza. This recipe was in inspiration from a pizza that Bill and I had eaten at one of the local restaurants in St. Helena, CA. Start with your favorite pizza dough. (Trader Joes is great and all you have to do is roll it out) par-bake it on a lightly oiled pizza stones. Smear the dough with a bit of olive oil and sprinkle with fresh cut Thyme. Slice a whole sweet onion very thin. Caramelize in olive oil/butter cooking long and slow. (I start with oil and continually add small amounts of water in a non-stick pan. As it renders down just let brown and add/toss continually – then when they are browned thoroughly, I give a quick hot sear to add texture.) Set aside to cool. Remove oil from fry pan, leaving just a little, while adding a bit of butter and fresh garlic to par-saute the shrimp. (don’t let get cooked through or they will get tough) Then set aside. After the crust is par-baked, sprinkle about a cup of shredded mozzarella cheese evenly on the crust. Next sprinkle about ½ cup of fresh chiffonad (chopped thin slices) spinach, then evenly lay out the lemons, cleaned, de-veined and tails removed – shrimp (one package), next evenly place the lobster. Season with a little salt & pepper. On top of that, spread another cup or so of mozzarella and top with the caramelized onions. Top with a bit of the fresh Thyme. Add baby lobsters (Homarus americanus) that I found at Trader Joe’s. They come frozen shelled and pre-cooked… thaw and set aside. We also pulled them apart to be loose little pieces, rather than placing them on the pizza in a “chunk”.